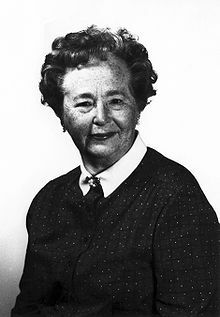 Gertrude Belle Elion was born on January 23, 1918 in New York City the daughter of immigrant parents. She grew up in New York City and the Bronx, which at that time was a still a suburb of New York with many open lots for children to play in. By her own account she was a child with an insatiable thirst for knowledge and she did well in all her classes. Her interest in science was sparked by the death of her grandfather, who died of cancer when she was 15. When she went to Hunter College in 1933, she chose to study science and in particular chemistry. After graduating from Hunter College she had trouble finding work, but was eventually able to able to find work teaching and as a laboratory assistant. In 1939 she entered graduate school at New York University. The only woman in her class, she continued her studies, taking work as a substitute secondary teacher, graduating with a masters in chemistry in 1941. After finishing her masters she took a job working in the quality department of a food company. She soon bored of this work and looked for a job doing research. The most interesting position she found was working in George H. Hitchings' laboratory at Burroughs Wellcome. Hitchings was working on antagonists to nucleic acid analogs and she worked for him as an organic chemist, synthesizing new compounds. Nucleotide and nucleoside analogs are compounds that resemble nucleic acids. These compounds can be used to treat patients with viral diseases, cancer and can also be used as immunosuppresent drugs used for organ transplants. Viruses, replicating cancer and immune cells can be inhibited if their ability to reproduce DNA is inhibited. These compounds inhibit the synthesis of new DNA, by substituting a compound that resembles a nucleic acid or nucleoside but which blocks further synthesis. For their work in developing these compounds Elion and Hitchings were awarded the 1988 Nobel Prize in Physiology and Medicine. Shortly after taking the position in Hitchings laboratory, Elion began taking classes to earn her Ph.D. After a year of taking classes she was told that she would have to work on her Ph.D. full time. Given the choice she continued her work for Hitchings. She worked for Burroughs Wellome until 1983 when she retired and assumed the status of scientist emeritus. Other awards won by Elion include honorary doctorates from the Polytechnic University of New York and Harvard University, The National Medal of Science, and induction into the Inventors Hall of Fame, of which she was the first woman to be inducted. She was elected into the National Academy of Science in 1990 and to the National Institute of Medicine in 1991. While on her daily walk on February 21, 1999 she collapsed. She was admited to the hospital and passed away at midnight at the age of 81.